The Hershey Company (HSY - Get Report) had a not-so-sweet fourth quarter, but this year it's pivoting with salty plans to make up for losses. The chocolate maker posted a sales dip of 1.6% on Thursday, Feb. 1 and missed the Wall Street forecast of $1.07 in earnings per share, instead reporting $1.03. Net sales were $1.94 billion, down from $1.97 billion from the same period last year. But it's anticipating between 5% and 7% of growth in 2018 as it integrates SkinnyPop popcorn maker Amplify Snack Brands Inc. (BETR , which it acquired for $1.6 billion last month. The deal was just finalized a day prior, according to CEO Michele Buck. "I am very excited about the acquisition of Amplify as we now have a meaningful presence, with the addition of the SkinnyPop brand, in the fast-growing warehouse salty snack aisle," Buck said in a statement. "Our goal is to capture more consumer snacking occasions with a broader portfolio of brands," she told analysts in the earnings call. "The acquisition of Amplify is a step in our journey to becoming an innovative snack powerhouse." In 2017, Hershey expanded its snack mix product portfolio with Hershey's and Reese's chocolate-dipped pretzels in large-format bags. "While early, results are encouraging," Buck said. Compared to others in the consumer packaged foods space, Hershey is late to diversity, industry experts told TheStreet following the company's Amplified acquisition. The deal "is very indicative of what's already happening in the food space within CPG," said Prashant Malaviya, the senior associate dean of MBA programs in the McDonough School of Business at Georgetown University. "You see this across the board with Kellogg (K - Get Report) and Mondelēz (MDLZ - Get Report) as the industry is betting on broader portfolios that cut past traditional categories." The confectionery giant is not turning its back on sweets. Sales performance is still "pretty strong," Buck said, pointing to 2.5% growth in the candy and chocolate segments. This year it will launch new candy products, including the Hershey's Gold Bar, Cookie Layer Crunch Triple Chocolate Bar and Reese's Outrageous Bar. The fourth-quarter sales decline, according to Hershey, can be attributed to the timing of shipments. 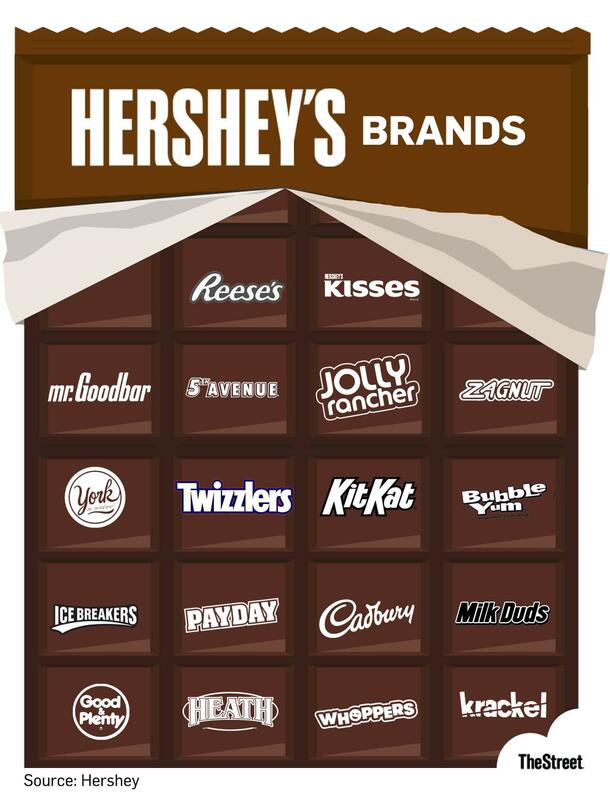 Sales fell in North America as well as in Hershey's international segments. The sales also couldn't compare with last year's, when the launch of the Hershey's Cookie Layer Crunch disproportionately boosted sales. Sales in the chocolate segment are susceptible to upticks when there's innovation and new products, Buck said. Hershey's main chocolate brands like Reese's and Kit Kat, nonetheless, saw a 2% sales bump in the fourth quarter and a 5% rise in the full year. Hershey shares fell 6% on the session.